Leader of the National Party Bill English speaks to supporters at the party's election event at SkyCity Convention Centre in Auckland on September 23. 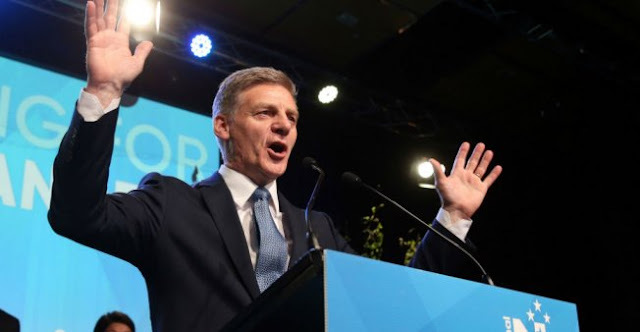 Prime Minister Bill English's National Party won the most votes in New Zealand's general election on Saturday but not enough to form a government without help from other political parties. That means New Zealanders may need to wait for days or even weeks to confirm whether English will retain the top job as the various parties try to negotiate with each other to form a coalition. There remained a remote chance that English's main challenger, Jacinda Ardern, could take the role. The results were welcomed by the National Party, which is seeking a fourth consecutive term in office. And they offer some redemption for English, who led his party to its worst-ever defeat in 2002. "The voters have spoken and now we have the responsibility of working to give New Zealand a strong and stable government," he said. He thanked Ardern for a hard-fought campaign, which he said had motivated and engaged more New Zealanders than any campaign he could remember. "We gave it everything, and we got better and better," he said. Ardern said she called English to acknowledge to him that his party won more votes. She said she couldn't predict what decisions the leaders of other parties might now make. "I've come off the field knowing we gave it our all," she said. English became finance minister in 2008 when his party was led to victory by John Key. He spent eight years in that role before taking over the top job last December when Key resigned. Vote tallies show the National Party won 46 percent of the vote, Ardern's Labour Party won 36 percent, the New Zealand First Party 8 percent and the Green Party 6 percent. Under New Zealand's proportional voting system, large parties typically must form alliances with smaller ones in order to govern. The Green Party typically aligns with the liberal Labour Party. But who New Zealand First will favor remains unclear. The party is led by maverick Winston Peters, who said Saturday that he would not be giving any answers over the next day or two until there was time for further consultation. Ardern had enjoyed a remarkable surge in popularity since taking over as opposition leader last month. The 37-year-old was greeted like a rock star at large rallies and has generated plenty of excitement among her fans. English, 55, ran a more low-key campaign, highlighting his experience and the economic growth the country has enjoyed over recent years. He's promising tax cuts for most workers. Opinion polls indicate there was a swing back to English in the waning days of the campaign after Ardern had all the early momentum. At stake for both candidates was how to capitalize on New Zealand's growing economy. English said people should stay the course after his government set the country on a path toward increasing prosperity. Ardern said she wants to build thousands of affordable homes to combat runaway house prices, spend more money on health care and education, and clean up polluted waterways. English said he thinks the televised debates between the two candidates helped swing the momentum his way, as people focused more on the issues and how policy changes would affect them. But his opponent accused him of scaremongering over her plans for taxes and the economy. "Certainly it's been somewhat frustrating dealing with their negative campaign," Ardern said. English's campaigning went better than many expected, including himself. He was seen by many as more of a numbers guy than a schmoozer. But he said he was surprised at how much he enjoyed all the handshaking.